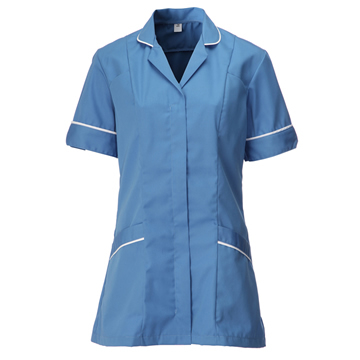 Nursing agency uniforms are generally not provided by the agency itself. So if you’re an agency nurse you’ll be required to buy your own uniform. These days agency’ nurse workwear is as varied as the roles. You’ll find posts require very specific uniforms. Depending on whether you have any specialisation you may be required to wear scrubs or tunics or dresses in specific colours. Nursing agencies also want to know staff will look professional. It’s also true to say that it can be difficult to get your hands on quality uniforms because many workwear suppliers have minimum order requirements. We don’t. We currently have 13 different styles of step in panel dresses in two different designs: solid colours with contrasting piping, and stripes. Plain dresses include Step In Panelled Female Dress – Lilac, Step In Panelled Female Dress – White, and Step In Panelled Female Dress – Hospital. Striped designs includeStep In Panelled Female Dress (Stripe) – Navy and Step In Panelled Female Dress (Stripe) – Blue. Features of the dresses include short sleeves with shaped cuff ends, rounded collars, pockets, and a concealed zip front fastening. Available sizes are 8-28, all have a 107cm finished length. There is no minimum order and your name or a logo can be added to any style. Our A-Move Tunics were specifically developed with nurses in mind. 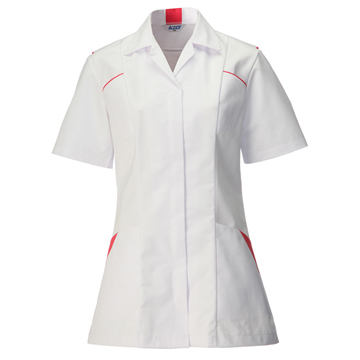 The styles for both men and women are white with contrasting trim to the pockets, collar and back: Perfect for agency nurses uniforms. But what really sets the Female A Frame / Move Tunic andMale A Frame / Move Tunic apart from any others is the A Frame itself. This means built-in internal mesh and open arm-hole vents. These help to keep the wearer cool and support freedom of movement. Vital in a nurse’s role. Female tunics are available in sizes 8 to 28 and men’s in 36 to 48. Colour trims include Jade, Burgundy and Navy. If your role involves moving, lifting, bending or stretching these tunics are noticeably cooler to wear and less restrictive than standard tunics of any design. Simple. Our Trousers complement our tunics. We have 3 styles of female trousers and 4 for men. Our female trousers include the flattering Female Bootleg Trouser – Navy and the extra-comfortable Female Elasticated Trouser – Navy. The bootleg trouser comes in sizes 8 to 28 and the elasticated trouser XSmall to XXLarge. Both come in Regular (76cm) and Tall (81cm) fits and have a zip fly and pockets. For men, our Men’s Trouser One – Black features sewn-in front creases while Men’s Trouser Two – Navy has sewn down front pleats – perfect for nurses. Both sizes are available in sizes 30-42 and in Regular (78cm) and Tall (83cm) leg lengths.